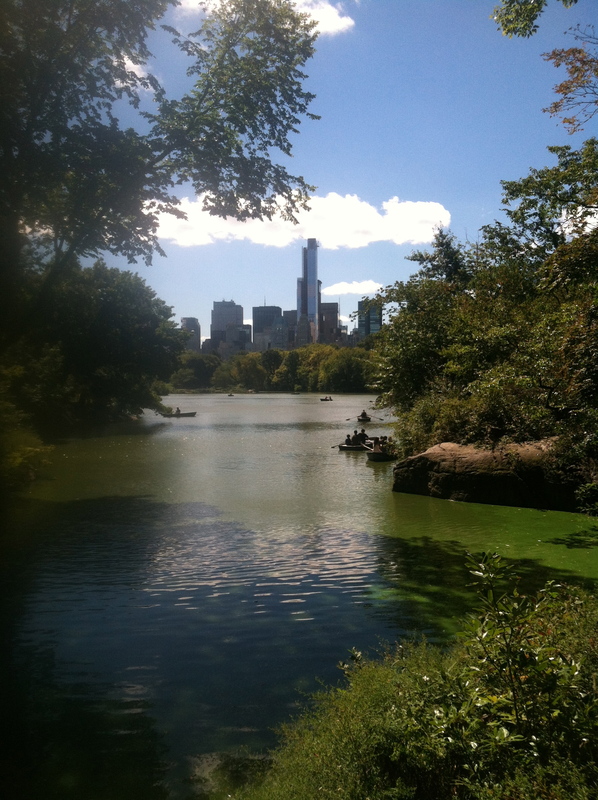 Last weekend, I flew to NYC to spend a long weekend. 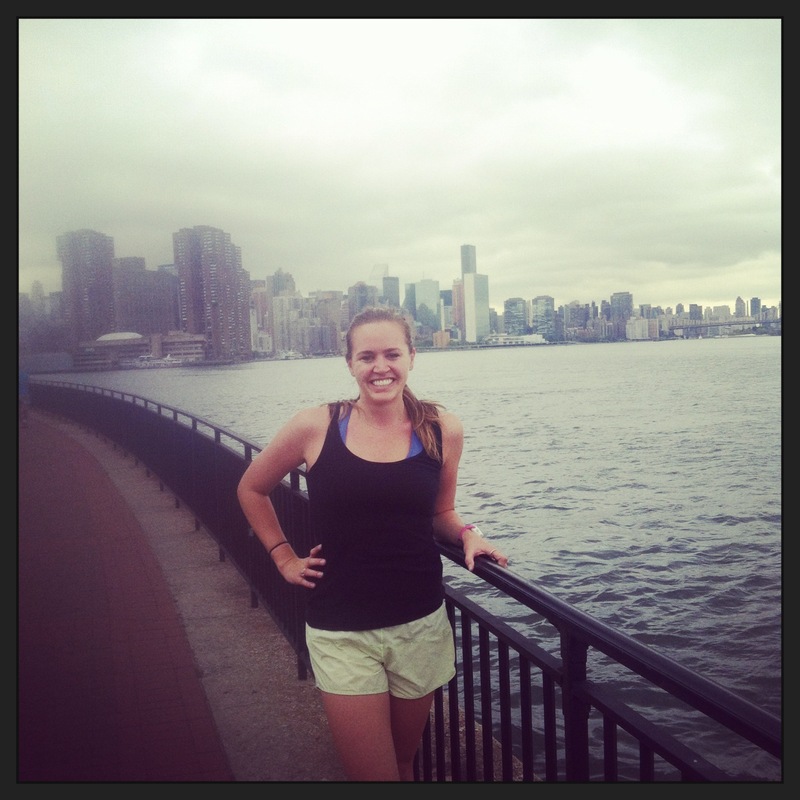 I spent Thursday morning through Sunday exploring Manhattan and Brooklyn with three of my best friends from my sorority, and I also got to visit my aunt! It all started late Wednesday night when I took the red eye from LAX to JFK. Red eyes are scary-sounding, but I actually totally recommend flying that way. I slept almost the entire way, and felt energized when I landed! 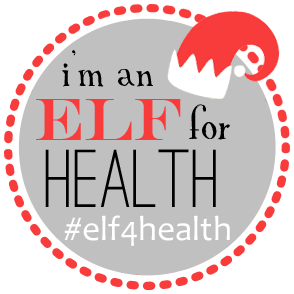 (I couldn’t have done it without my neck pillow, eye mask, and ear plugs though, let’s be real). My aunt Cheri picked me up at JFK – we got a little bit lost en route to her apartment, but a little while later we made it to Brooklyn. Our first order of business (no joke) was to watch the previous night’s episode of Real World/Road Rules: The Challenge (Rivals 2). My aunt and I have shared this obsession for years, so before we got the day started I routed for my favs, Emily and Paula and Jordan and Marlon. Once we were all ready, my aunt Cheri, her wife Janet, and I headed out to explore their borough. 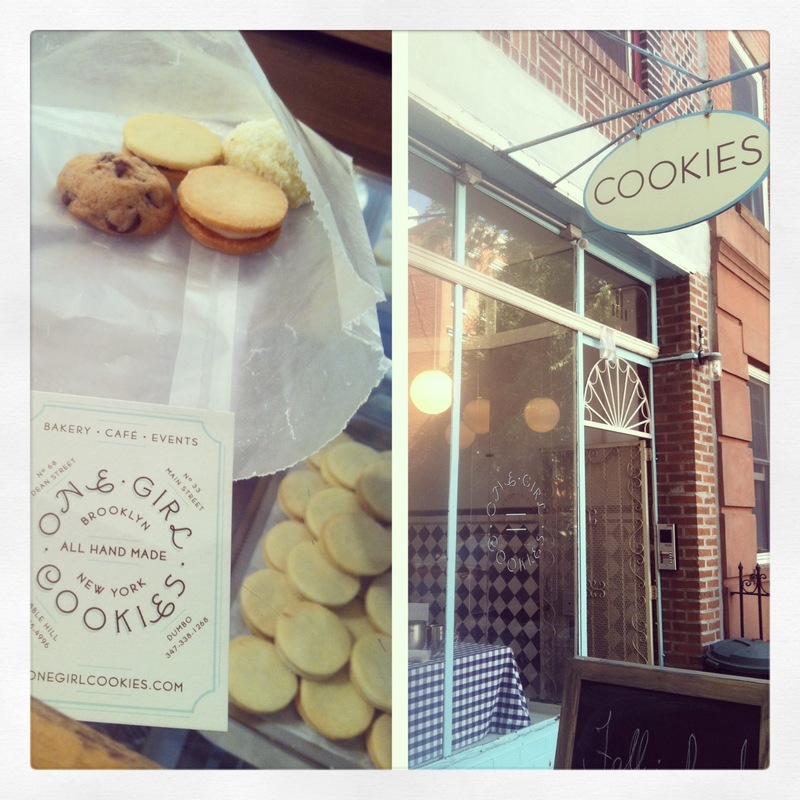 Next, we cruised by One Girl Cookies in Cobble Hill (also a rec from C’est Christine). The place was so cute and hit the spot big time. My aunt said she loved “small foods” and “sugar” so she was game to try them out. I loved how the cookie shop had girls’ names for each cookie. 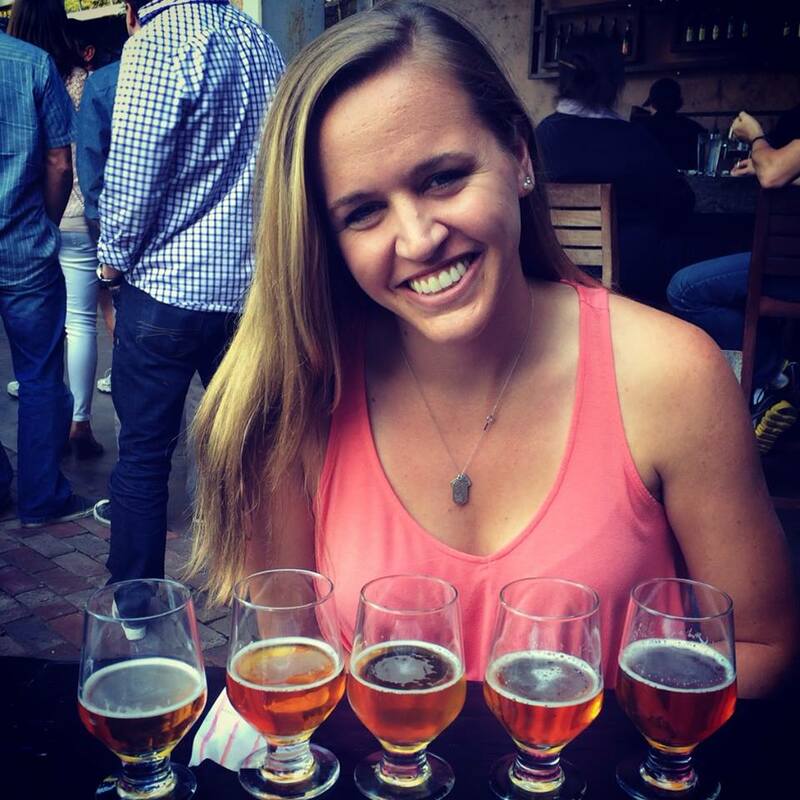 I can’t remember which one was my favorite – they were all delicious. 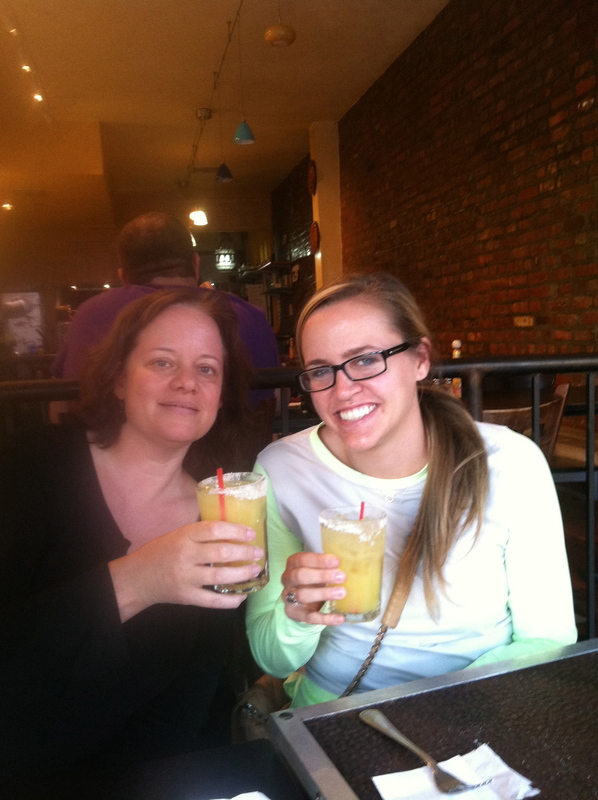 Before I took the subway across the river to meet my friends in the East Village/Lower East side part of town, my aunt, Janet, and I did a couple of margaritas at a local taco place they like. I sent my mom a photo (I still maintain that my eyes were red-eyes and not drunk-eyes) because she loved the margaritas on her last visit. 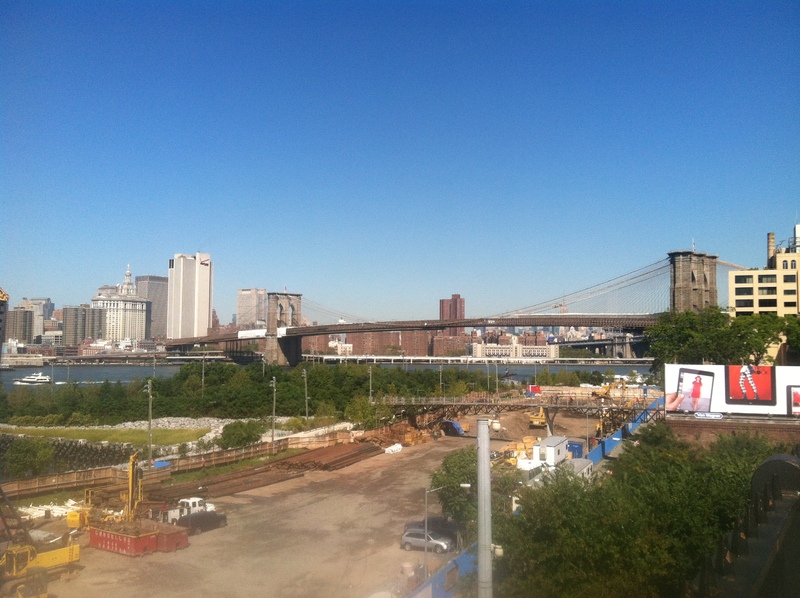 It was the perfect Brooklyn send-off! Janet and me. Ignore the haggardness, I was still in my red-eye clothes. On the way to the subway, my aunt pointed of the Barclay Center where the VMAs were held earlier this year. You know, #WeCan’tStop? My inner (outer?) MTV nerd was stoked. 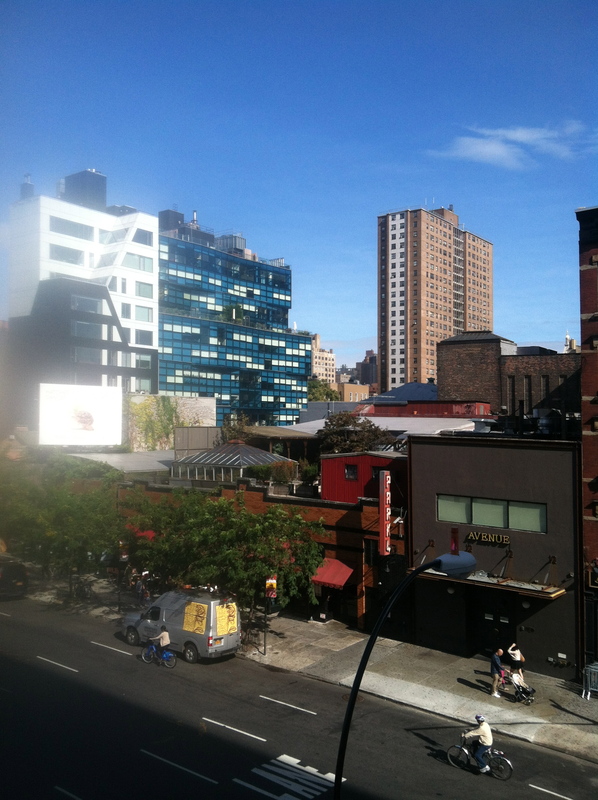 I took the subway into the East Village and met my friends at the rental we had secured through Air BnB. I have used VRBO before but this was my first venture into Air BnB. Our place had a good location, but it definitely just felt like two guys decided to vacate their apartment for the weekend. There were no guest amenities and their fridge was stocked…with their stuff. The place was perfectly fine, it just wasn’t nice. 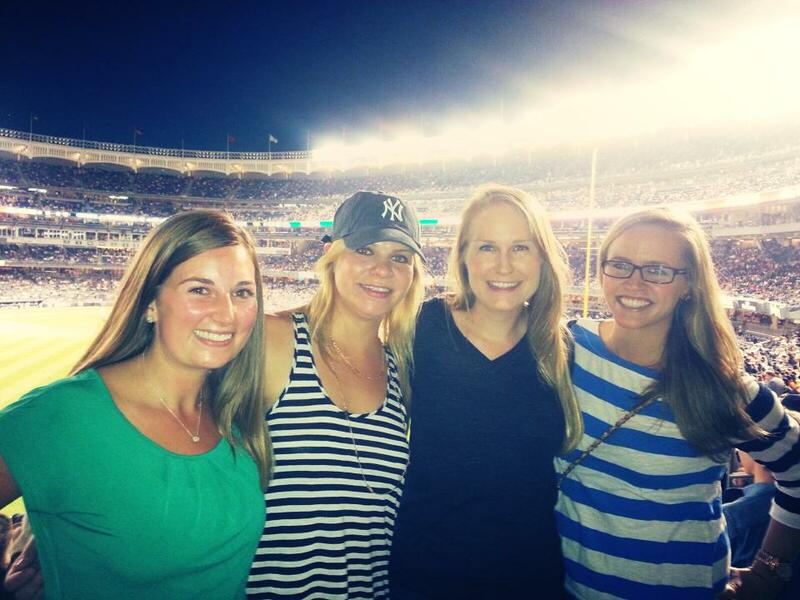 I was meeting my friends Michelle, Kathleen, and Kate — three of my closest friends from my sorority daze. 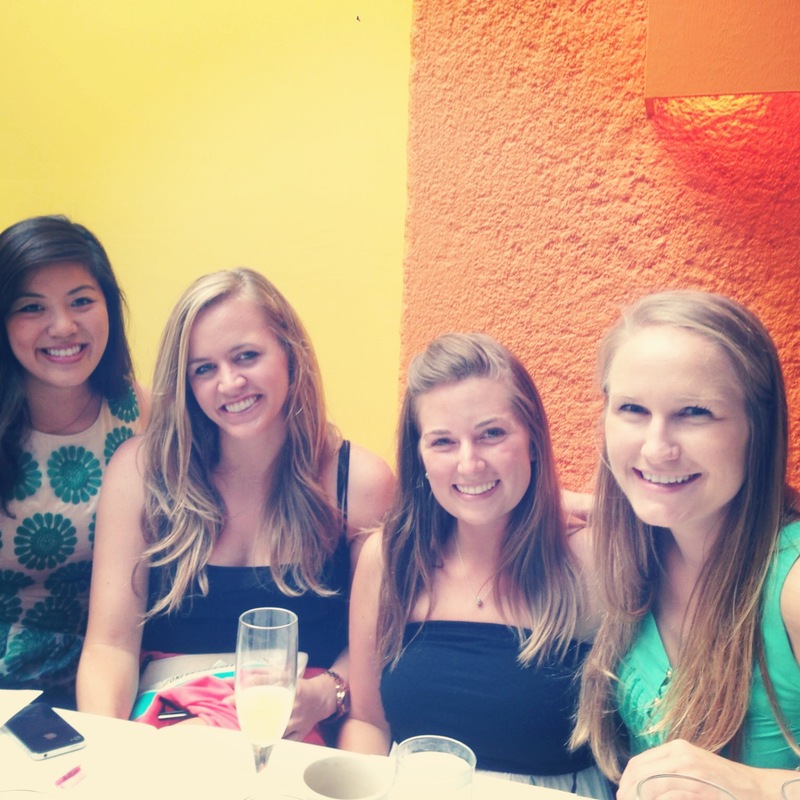 They all live in SF, and while we see each other when we can, it is still not enough! 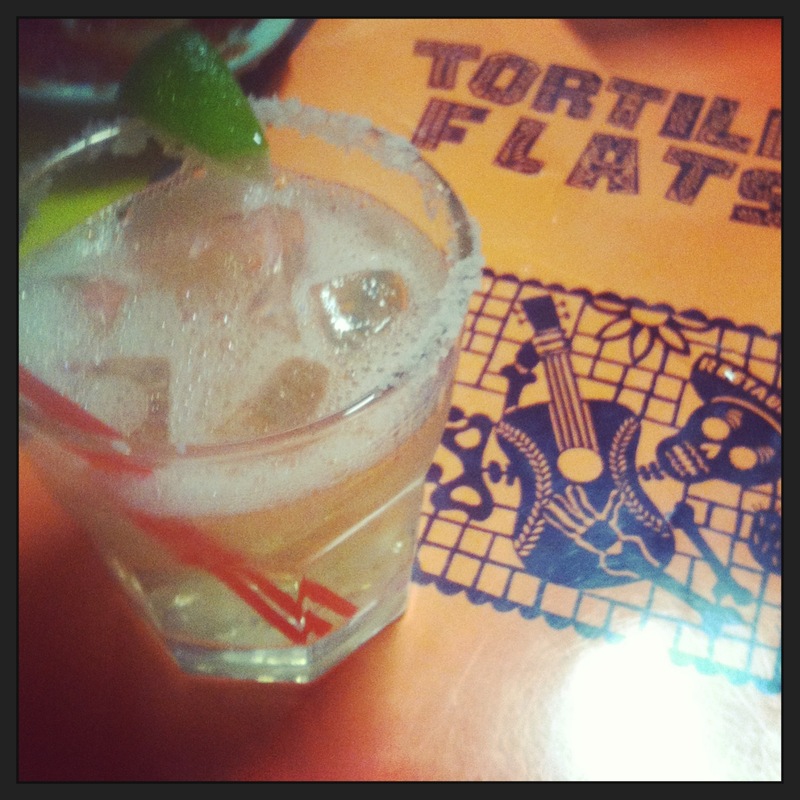 The first order of business was dinner in the West Village with their friend, Michael, at a place called Tortilla Flats. The guacamole and margaritas were incredible, and Michael was funny, friendly, and super generous! 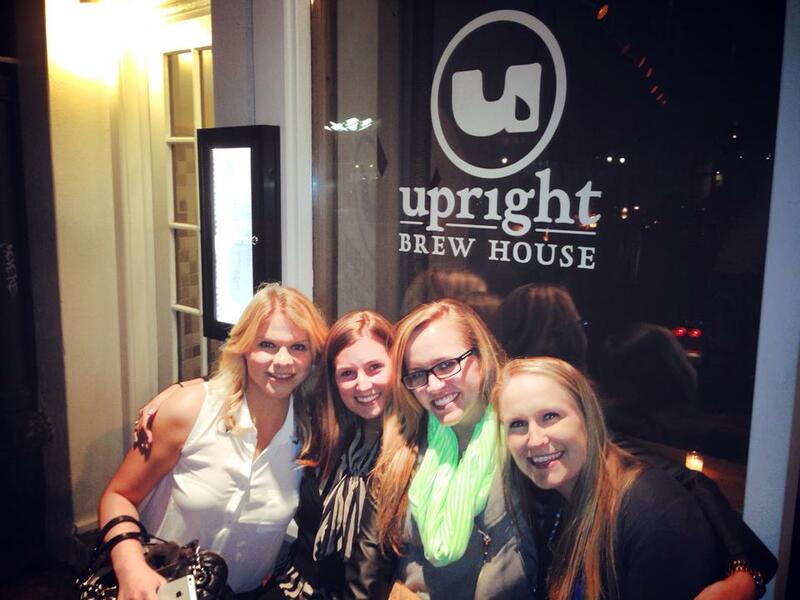 We also hit up a couple of other local bars — Upright Brew House (loved) and a super swanky place aptly titled “Employees Only.” (I have already instructed my friend Ryan, lover of all things bougie, to go there on his next NYC trip). michelle, kate, a very washed out me, and kathleen ready to get our beer drinking on. 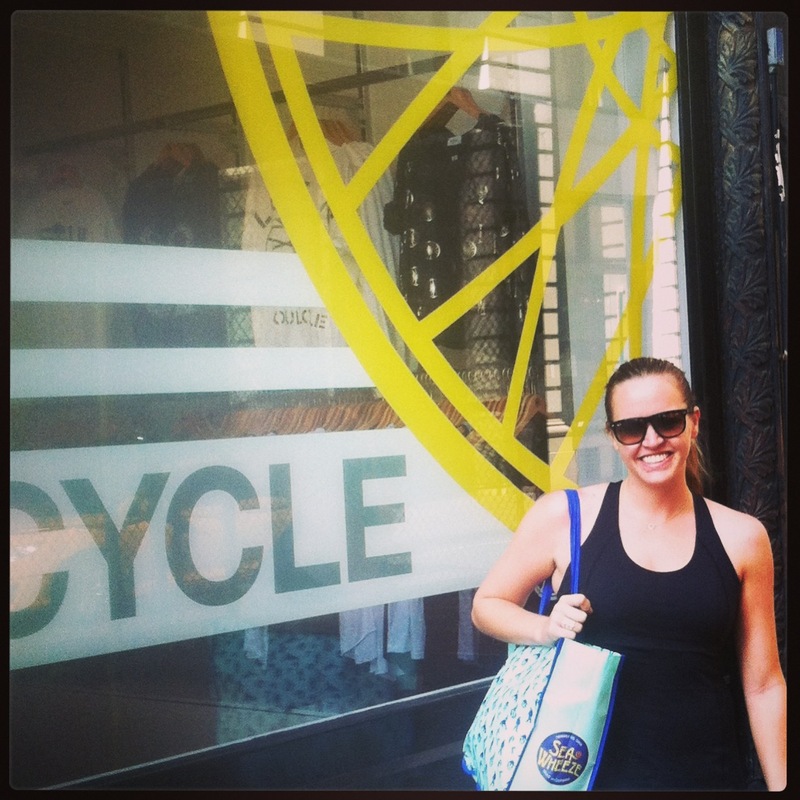 On Friday morning, Michelle and I had a very important #SoulDate at the Union Square Soul Cycle. We loved our class with Anthony F., and I may have incorporated his closing track (Kaskade – Atmosphere) into my latest spin playlist. It was a great way to the start the day, and not TOO touristy. Later, Michelle and I stumbled upon a fabulous brunch spot — Friend of a Farmer — for some post-spin fuel. 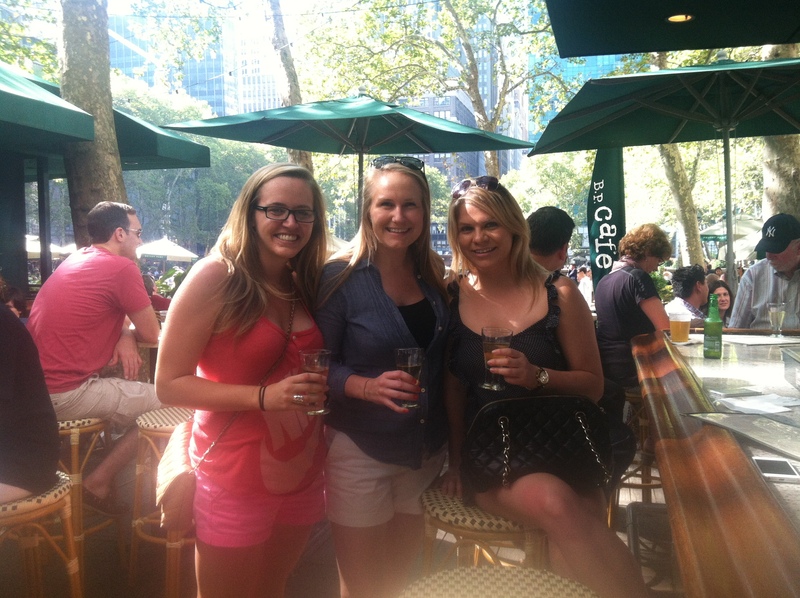 We then met up with Kathleen and had a couple of drinks in Bryant Park. The weather was GORGEOUS. day drinking in Bryant Park. Doesn’t get a whole lot better than that. Kate had to work (the plight of the Googler), but we met up with her that night for a trip to Yankee Stadium to watch the Yanks crush the SF Giants. Our seats were out in the boonies, but we saw A-Rod beat Lou Gherig’s grand slam record, scored a Nathan’s hot dog, and soaked up the fun Yankees Stadium atmosphere. That place is incredible. 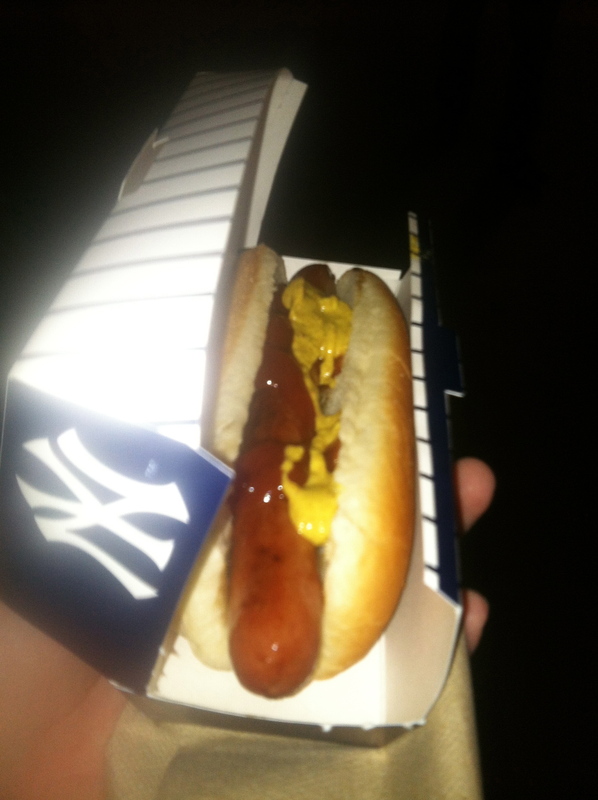 #1 Reason Yankee Stadium > Wrigley Field. They let you put ketchup on your stinkin’ hot dogs! I have officially checked off 10 MLB parks off my bucket list. 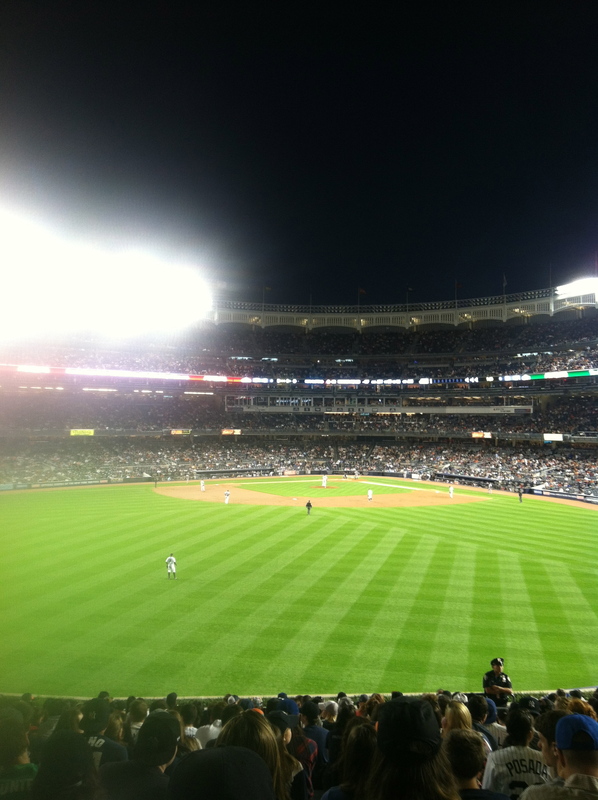 (if you count both old and new Yankee stadiums as separate…I do). I have been to all 5 in CA, Safeco Field (Mariners), Wrigley Field, Fenway Park, and both the old and new Yankee stadiums. I am not sure what #11 will be. Any suggestions? On the subway ride out of the Bronx, I got into it with a Giants fan who overheard me talking about the Dodgers. I was recounting a meme I had seen where Brian Wilson (now a Dodger) was accidentally rooting for the Giants, and was laughing about his confusion. This woman got all offended that I wasn’t respecting Wilson and that I should be happy to have him. I insisted I was, and also explained that her little organization didn’t want him anymore. 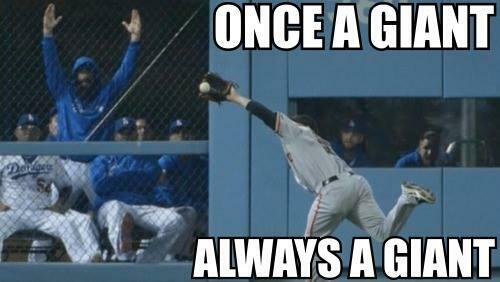 Giants fans…god. 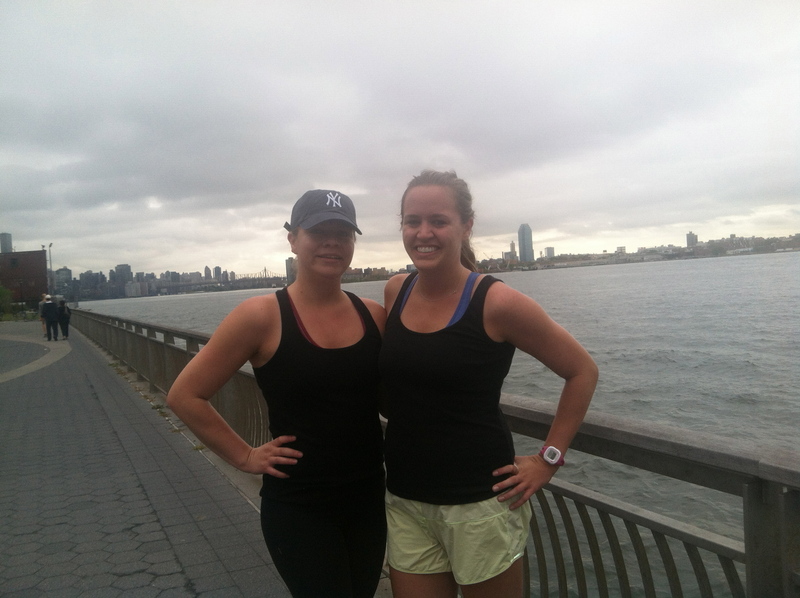 Saturday morning started for me and my fellow fittie, Michelle, with a low-key 4-miler along the East River. It was a little humid but a fabulous way to start the morning. 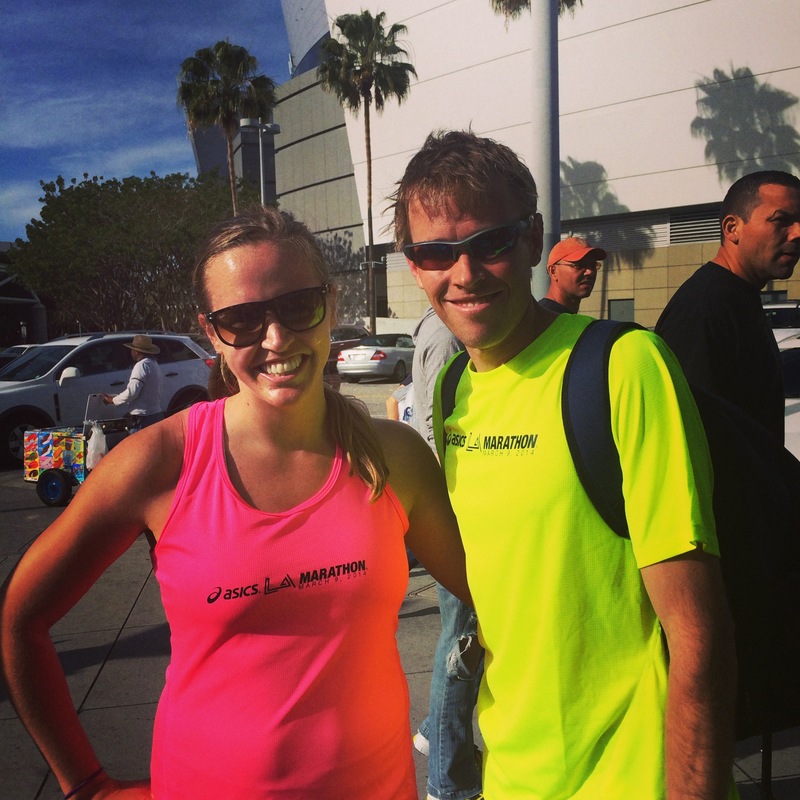 Thanks for being my running bud, Michelle! 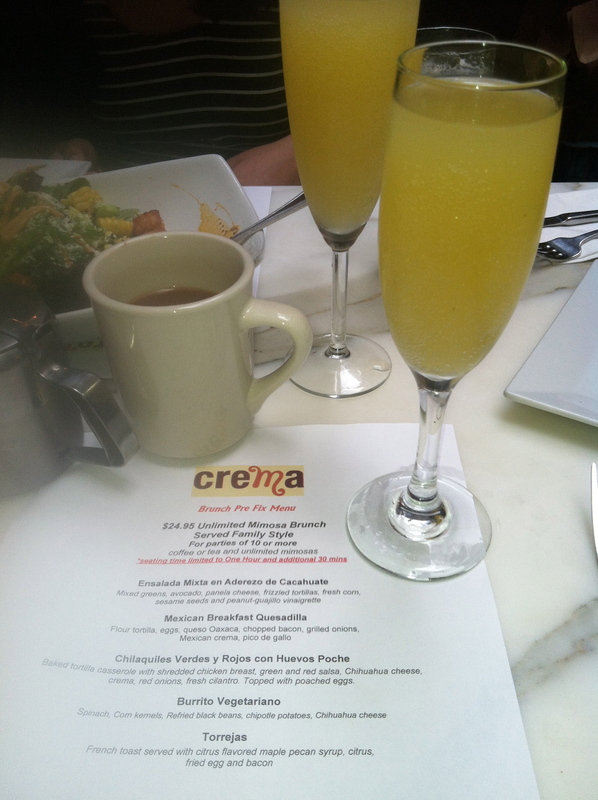 We hustled to get ready for brunch in Chelsea at Crema Restaurante. We met up with Amy, who was in town from Beijing (! 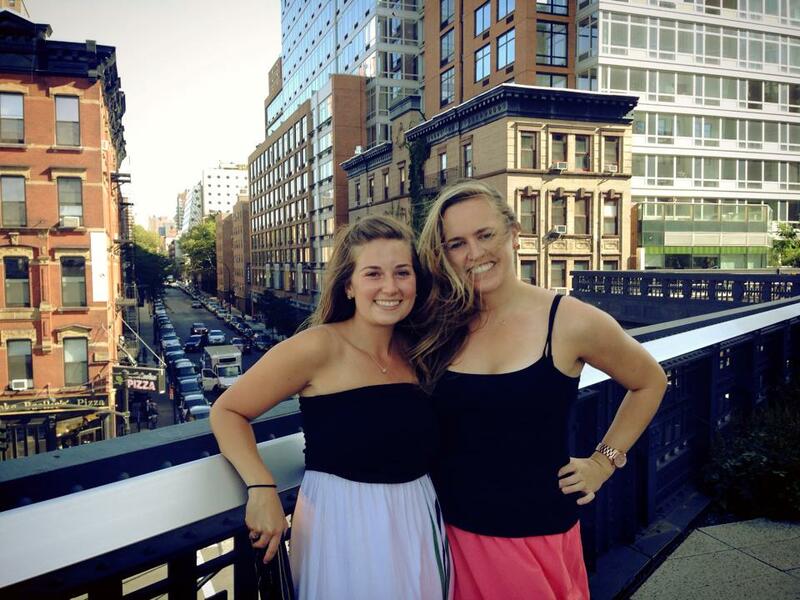 ), as well as Kiira, Trisha, and Kelly, friends from our sorority who live in NYC. It was great catching up with them over mimosas and delicious Mexican-inspired, family style brunch fare. Amy, me, Kate, and Kathleen brunching it up. I was obsessed with the french toast dish, but all of it was delicious! After brunch, Kate and I headed out for a few hours. 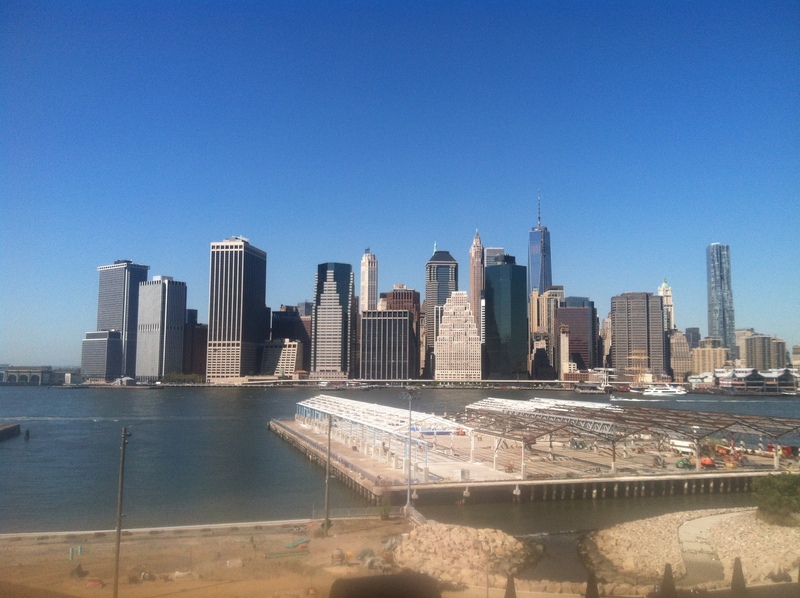 We explored Chelsea Market, walked the High Line, and stopped for a beer at the beer garden at The Standard. Such a fun afternoon! 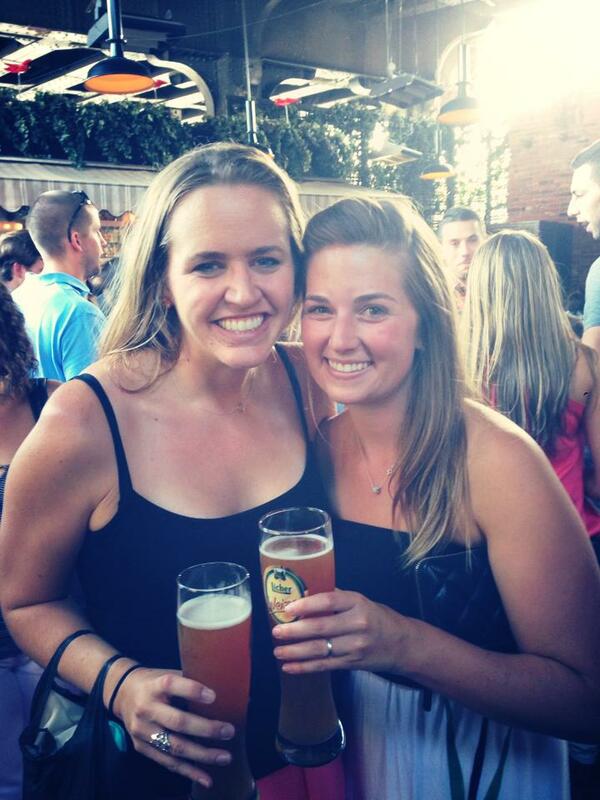 Later that night, I went out with Kathleen to a super legit beer garden in Brooklyn. We ordered kas spaetlze and it brought me right back to Vienna. And it was delicious. We got hit with a little bit of rain on Saturday, but it was all cleared up by Sunday. 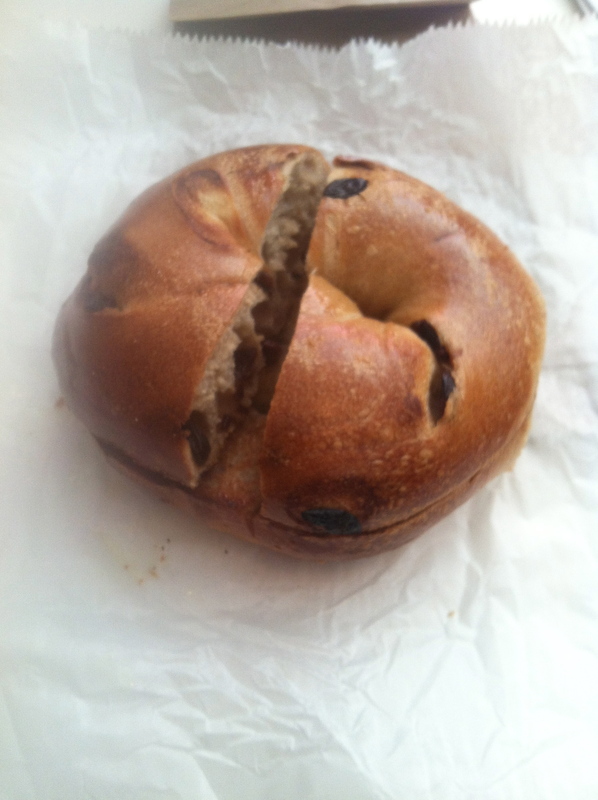 My last day in NYC started with a delicious NY bagel, coffee, and a stroll through Central Park with Kathleen. We stumbled upon a cute little Farmers Market in the Upper West — the $2 piece of pizza I had was perfect. We mozied back to our AirBnB place, finished packing, and I grabbed a shuttle with Michelle back to JFK for our respective flights. The shuttle took FOREVER and was sort of uncomfortably hot and quiet — are all Super Shuttle experiences like that? This was my first. I made it to my gate with only 15 minutes or so to spare. 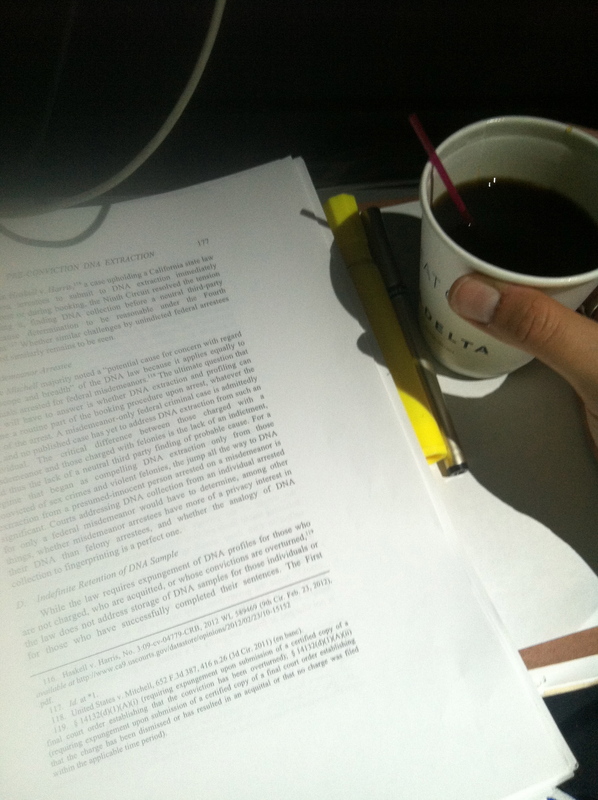 I enjoyed the 5.5 hour flight back to LAX — I listened to some music and finally got back in the law school grind. My friend Aviva was super generous and picked me up (who needs Super Shuttle when you have nice friends?). 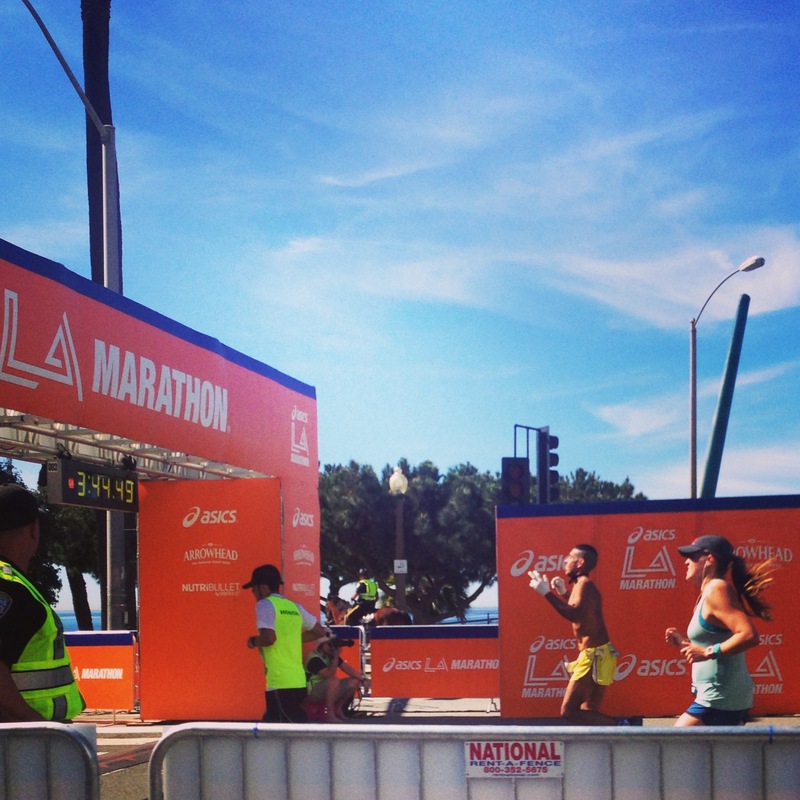 And with that, my whirlwind of a weekend came to a close!